Discount JUGS Football Passing Machine - Free Shipping! If you ask me, JUGS named their football machines the exact opposite of the way they should have. 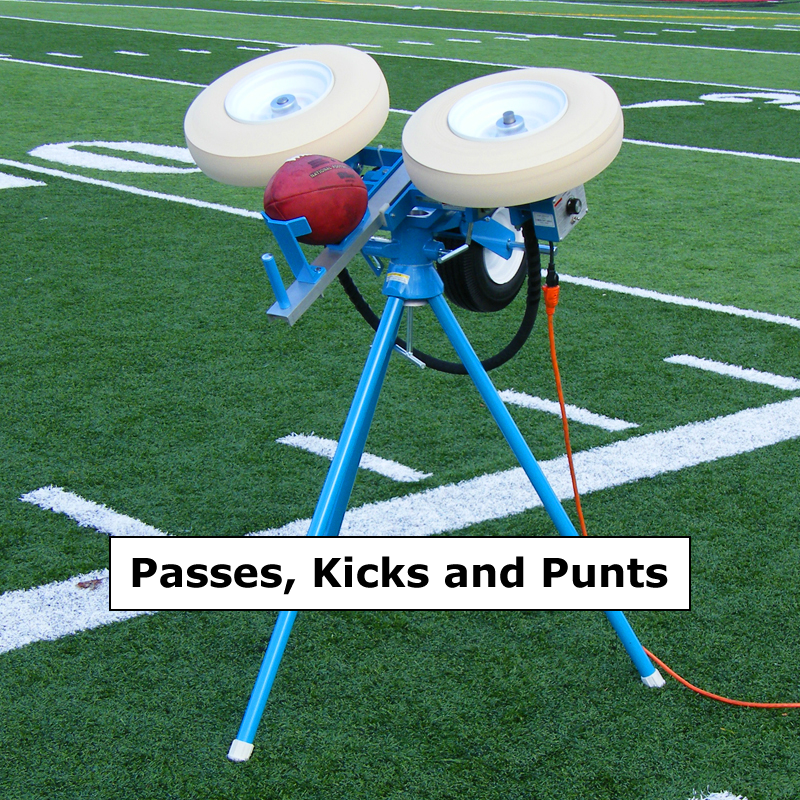 This machine, called the JUGS Football Passing Machine throws spirals, punts spirals and kicks end-over-end kickoffs. Their other football machine - the JUGS Field General - only passes spirals. You figure it out! That aside, this is the perfect machine for doing everything you would ever need a football machine to do. No more quarterbacks with sore arms, no more kickers with dead legs, no more receivers who can't get enough catch res in, no more punt and kick returners who don't get enough practice fielding kicks. This machine does it all! Extremely accurate, the JUGS Football Passing Machine throws perfect spirals to the same location every time. It can throw passes as short as 5 yards or as long as 80 yards, The same goes for end-over-end kicks. It can use any size or type of football from Junior size (age 9-12) all the way up to Pro size footballs. Please note that the football machine is most accurate when using the same type of ball with every throw and that it CANNOT THROW PEEWEE SIZE FOOTBALLS. This football machine is powered by any standard 110 volt electrical outlet. 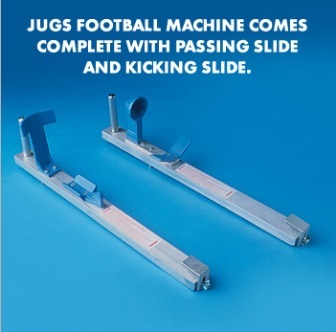 Built to last, the JUGS Field General football passing machine is made of steel and is backed by JUGS Sports' 5 Year Warranty. Best of all, it includes transport wheels that make it easy to roll the football machine to and from the field. JUGS Sports guarantees that the JUGS Pitching Machines are well made; of good materials, and workmanship; and agrees that if, within five years after shipment thereof, any part so guaranteed should fail because of defective material or workmanship in its manufacture, the Company will repair or replace such part, free of charge F.O.B. to its factory in Tualatin, Oregon; provided, however, that upon request, the Buyer shall return the allegedly defective part to the Company s factory with transportation charges thereon prepaid. No matter where you order a JUGS Football Throwing Machine from, NOBODY actually stocks them; they all ship directly from the manufacturer's warehouse located in Tualatin, Oregon. Therefore, the shipping time frame is exactly the same no matter what website you order from (we hope that it is this one!). JUGS Football Throwing Machines typically take 2-4 business days to ship from the time you place your order. They ship via Federal Express (FedEx) Ground and could take anywhere from a day or two to a week to get to you AFTER being shipped, depending on your proximity to their warehouse. We will notify you of your tracking number the moment we receive it from the manufacturer's warehouse. Click here to download an easy to read, printable PDF of the JUGS Field General Owner's Manual.